Target 6: Housing Affordability | Propel L.A. Homeowners utilize about 46 percent of occupied housing units in Los Angeles County. Buying a home anywhere in California may be expensive, but affordability remains an even more acute problem in Los Angeles County. Homebuying affordability is measured by the Traditional Housing Affordability Index. To set homebuying affordability target, we compare the housing affordability indexes in California and Los Angeles County. (Figure 9) The percentages refer to the proportions of local households that can afford to purchase the median priced home in the respective region. Using the data above, the average percentages of households that can afford to purchase the median priced home in California and Los Angeles County from 2006 to 2018 are 35 percent and 30 percent, respectively. Using the state’s average as our target, we hope to see at least 35 percent Los Angeles County households able to afford the median priced home within the county by the end of 2020. 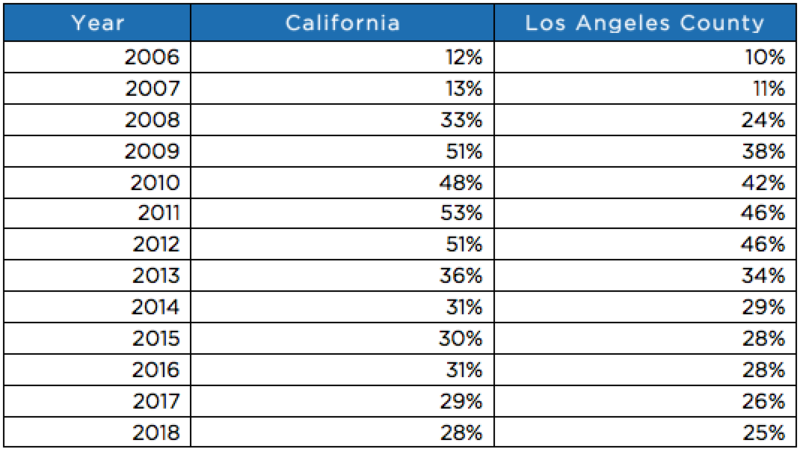 California Association of Realtors’ Traditional Housing Affordability Index (HAI) and Propel L.A. Analysis. Versions of this table are available starting in the first quarter of 2006. The latest available data is from the fourth quarter of 2018 as of the time of publication.